We are joining in the weekly Unplugged Project over at the Unplug Your Kids blog. Last week’s theme was Books, so I thought I would share an alphabet book the girls and I have been working on. We are simply using an inexpensive photo album that holds three 4×6 photos on each page. We have been having a great time looking through old photos that were never scrapbooked, as well as hunting through our most recent photos, to find pictures to match the letters. I print out the name of the object or person on my label maker. We are now getting to some of the trickier letters, like Q and V and X, and it is so fun to listen to the girls brainstorm about things we could photograph for those letters. They love looking through this “alphabet scrapbook” just as much as their baby books. I made similar books about colors & numbers using smaller photo albums for the girls when they were toddlers. My 5-year-old also has one she calls her “Word Book,” with photos of things and people she likes, along with the word. She has taken most of those photos herself. Even though my girls know their colors and numbers, and even most of their letters & sounds, these are still some of their favorite books to look at. It’s fun to be the star of your own book! These books are so beautiful! They are great for learning and memories at the same time! My daughter and I made one using a photo album and index cards – we put colors, numbers and letters on the index cards. With the numbers we’d put the appropriate number of stickers…one princess sticker next to the one, two princess stickers next to the two, etc. She really enjoyed that and liked looking through it. What an excellent set of ideas. Very lovely. Great idea! The books are beautiful. Those books are lovely! And they must be so much fun to make. What a wonderful way to use some of those photos that collect in cupboards, boxes and drawers (they do at my house anyway). No wonder your girls enjoy looking at these. I would too! Thanks for the inspiration! Great idea for the book and I have to say – I love your blog header – its totally unreal! Those are fantastic! 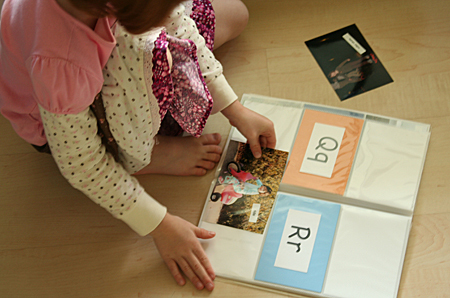 They look so nice and what a great idea using your own photos for it :) My daughter is learning her ABC’s right now so we’re going to make on of these. Thanks so much for the inspiration! What great books. I have so many old photos sitting in boxes I am going to have to try this one. Thanks for the idea. What a wonderful idea- that would be such a fun project for us to do this summer when it gets too hot to play outside! Thank you for this wonderful idea! I just love it and we have started one this week with my kindergartner. It is so fun to do and will be such a special keepsake as well. Thanks for sharing.